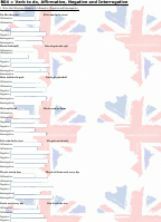 It�s a revision of the YES/NO questions with DO, DOES, IS, ARE, AM, WAS, WERE. I hope you find it useful! 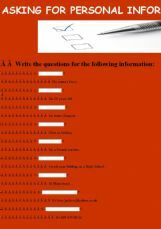 It�s an exercise to practise WH- QUESTIONS. I hope you find it useful! 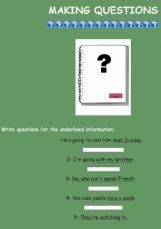 Students are supposed to fill in the gaps with a suitable interrogative pronoun, and after they have to match the right answer to their questions. Unscramble the words and answer the questions according to the picture. 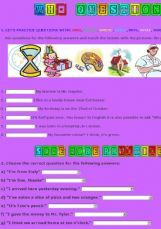 A warm-up for students to practice question words. Who, What, Where, When, Why, How, and Whose. Will work great for smart software, individual work, or group work in the classroom. 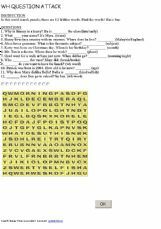 this is a word search puzzle created using WH question in terms of English grammar to stimulate mental capacities among pupils in elementary school.